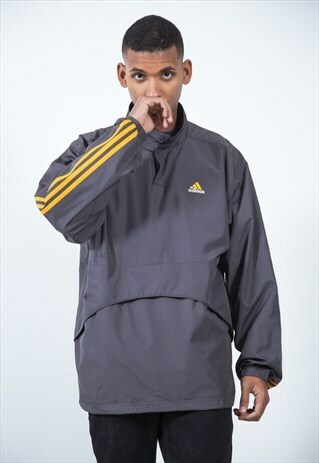 Vintage year-round: back to 90s with this Adidas Windbreaker Jacket! PLEASE NOTE! This item has small stains on the front. MODEL MEASUREMENTS: Andy ,our model, when buying at any High Street shop usually buys sizes W30/EU40 for Jeans and size L for jackets and shirts. His measurements are; Height: 1,86m/6ft Pit to Pit: 46cm/18" Waist: 77.5cm/30.50" Hips: 96.50cm/38". SIZE INFO: Due to item's vintage condition, the original tag might not show the true size. For this reason we measure every single piece and we add an Avelinas hand tag that identifies every item with the current size standards. If you have any question please check our size guide or write to us. We'll be happy to help you! CONDITION: Please note that at AvelinasVintage we sell true vintage pieces, which means the colour might vary slightly from the one in the picture and little imperfections can be found due to natural use. We strongly believe in recycling, that's why we avoid the use of new raw materials, reusing existing products from all over the world and giving them a second life. PLEASE NOTE: If you have any doubts about this item's material, please contact with us and we'll gladly help you out!